Hailing from Perak, this Universiti Teknologi Mara (UiTM) graduate has had a successful run in the last couple of years. In 2008, his solo exhibition Enough! was a sell-out with every piece being snapped up by art collectors, and in 2009, Samsudin was artist-in-residence at Rimbun Dahan, Kuang. The artist, who has also ventured into performance art, is best known for infusing pop culture, the art of comic books, and political satire into his striking works. Samsuddin Wahab (b. 1984) graduated with a Batchelor’s Degree in Fine Art, majoring in print making from UiTM, Shah Alam. 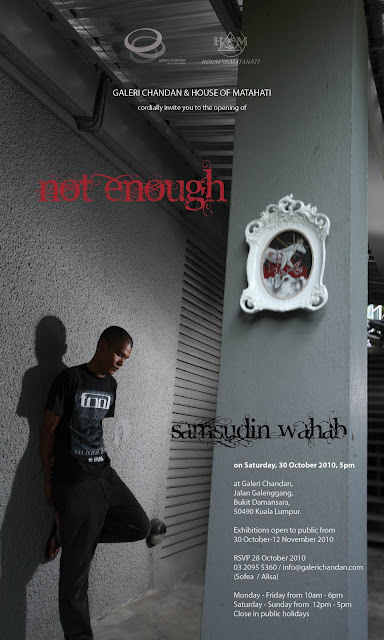 In 2008 he completed his first solo show entitled Enough at Taksu Gallery, Kuala Lumpur. He has also participated in numerous group shows including Energy Trap, Valentine Willie Fine Art, Kuala Lumpur, 2010; Young Contemporary Art Show: New Object(tion), Galeri Petronas, Kuala Lumpur, 2010; Locals Only!, Taksu Gallery, Kuala Lumpur, 2009; Imcas, Malaysian Contemporary Art Exhibition, Danga Mall, Johor Bahru, 2009; Un-Cut, Malaysia Art Festival, Copenhagen, Denmark, 2009; The 70th Mokwoohoe Members Exhibition and The Malaysian Figurative Artist, Korea, 2008 and ART Singapore, The Contemporary Asian Art Show, Suntec City, Singapore, 2008. He took part in the Rimbun Dahan Malaysia-Australia year-long residency programme in 2009-2010 and is part of the experimental sound and performance group SO sound.